The first thing you probably don't know about paczki is how the hell to pronounce the word. (“Poonch-key” or “pawnch-key” will suffice, even though people will be quick to correct you no matter what. Just nod politely.) Second is what they actually are. To those who go rabid for them every Fat Tuesday, the only question is: "Why can't I sate my hunger for these things?" The little Polish jelly donuts -- a rite of passage in cities with high Polish concentrations -- pack 400-500 calories and 25g of fat into a sugar-coated beast the size of a hockey puck. In preparation for Lent, millions are sold in mere hours. They're even the namesake of their own holiday. But there's so much more to them than sugar, fat, and revelry. Here's the skinny on the Fat Tuesday mainstay. Like many things in Poland, paczki have roots in Catholicism. They were created as a way to use up all the available sugar, eggs, butter, lard, and other goodness before Lent, during which folks give up an indulgence for 40 days. Rather than let all that stuff spoil, they whipped up what can best be described as the Polish equivalent of La Bombe. Sometimes, being thrifty means being excessive. The paczki's roots date back to the Middle Ages, when they were filled with pork fat and fried in lard. That variation tough to find now, but given the increased interest in Eastern European dumplings and fat-fried pastries, it's due for a comeback. During the Middle Ages' pre-Lenten celebrations, the rich dined on roast game and other delicacies. Peasants let loose with cabbage and jellied pigs' knuckles. 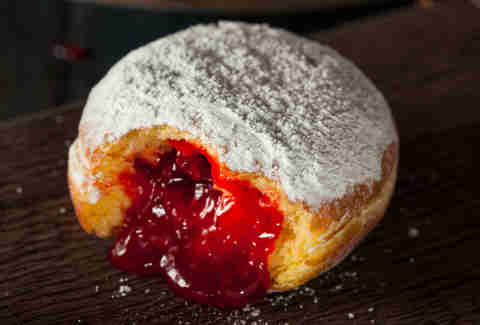 Paczki, however, were the common ground between the upper and lower classes, with rich and poor alike gorging on them. 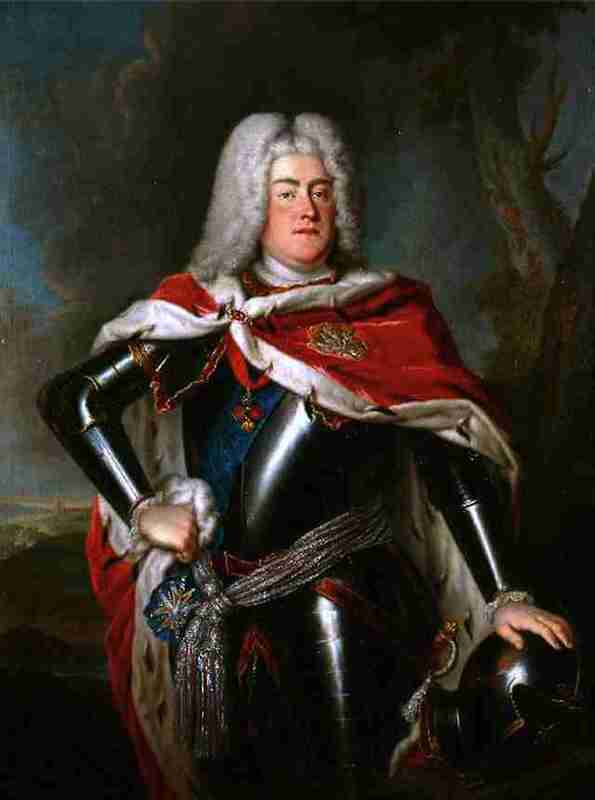 It was Polish King August III -- a monarch who was way more interested in kicking it around Europe and eating as much as he could than in ruling -- who is often credited with the paczki ditching savory for sweet. That's because he hired a bunch of French cooks to do their thing in his castle, and "their thing" wass making extremely delicious desserts. Lazy, yes. But this man gave us the paczki as we know it, so we'll forgive him. In Poland, the pre-Lenten celebration goes down on Fat Thursday. 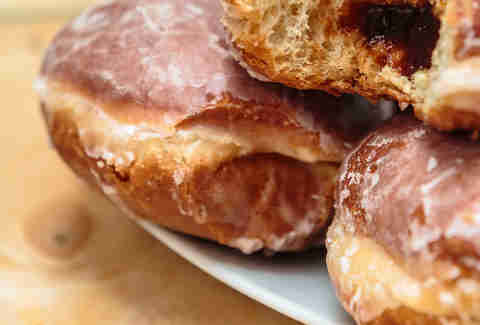 In Polish-heavy Midwestern cities like Detroit, Cleveland, Green Bay, and Chicago, Fat Tuesday is known as Paczki Day. During the holiday, local bakeries sell tens of thousands of fresh pastries in the morning, with people lining up around the block to get them. There are also parades, eating contests, drinking, and a lot of naps. Basically, Paczki Day is like Mardi Gras, but with strings of beads replaced with beads of sweat that come with caloric overload. In a move that would make one Homer Simpson drool himself to the point of dehydration, beloved Grand Rapids, Michigan-based Brewery Vivant has its own Fat Tuesday tradition in the form of Fat Paczki, an annually released amber ale brewed with dried prunes and powdered sugar. The bad news is, it'll only be available at the brewery when it's released on Fat Tuesday. The good news is it pairs great with the brewery's insane duck & brie nachos. The paczki-eating record stands at 23 pastries in 15mins, held by a Matt Holowichi of Plymouth, Michigan. The champion retired in 2015 after beating the record by ½ a pastry, and his nearest competitor by a full 10. The whole thing went down at the Polish Legion of American Veterans Post #10 -- coincidentally our favorite dive bar in Michigan -- located in the mostly Polish town of Hamtramck, Michigan, which is a city within the city of Detroit. All of this is to say, you should really go to Hamtramck. Much like the folks who wake up early to bake them fresh, most paczki have a little bit of grain alcohol in them. The spirit helps the pastry avoid absorbing too much fryer grease. 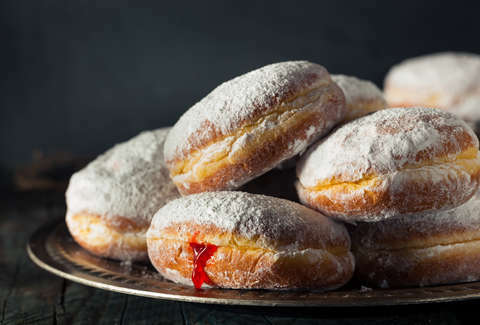 Common paczki fillings include plums, lemon, chocolate, and raspberry. Others include rose-petals -- a common ingredient in Polish cuisine -- and maple bacon -- a common ingredient in hipster cuisine. In 2004, Army Armstrong Films released Paczki: The Movie!, a documentary about paczki making in Lorian County, Ohio. Army Armstrong also produced such classics as Hollywood Comes to Vinalhaven, Ancient Futures: Learning from Ladakh, and the owl documentary Who Lives In Your Backyard. You can purchase Paczki and any of the other movies at the Army Armstrong site. We haven't seen it, so we're not sure whether that's a good idea. Andy Kryza is Thrillist's national eat/drink senior editor, and his last name is the reason "Y" is sometimes a vowel. Follow him to a Polish bakery at @apkryza.